Well, hello friends! 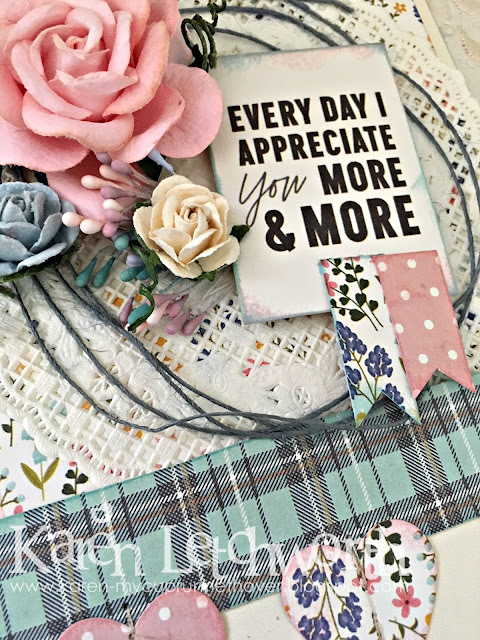 Thanks for visiting me today as I share a sweet little card I created using some lovely supplies from Scrapping For Less. I found their challenges here on the Scrapping For Less Facebook Page, and YOU can play along, too. Here's the sketch for February, and you can use anything from their sweet store (and that's A LOT of what we all love and use). I used an ivory card stock base, and patterned papers found in the American Crafts Jen Hadfield Simple Life 6x6 Paper Pad. I absolutely LOVE these sweet patterned papers from American Crafts. In fact, Scrapping For Less carries LOTS of fabulous Patterned Paper Collections from companies we all know and love. I also did some machine stitching on the hearts at the bottom, added a vintage ivory doily, some flowers and stamens, and the sentiment is also from the American Crafts Jen Hadfield Simple Life 6x6 Paper Pad. I used the patterned papers on the background, strip at bottom, hearts, and flags on sentiment. I recently applied for a position on the Scrapping For Less Design Team. While I have no idea what will become of this, I want to encourage all of you to get our there and apply for your "dream team". We all get rejected from time to time, and that's quite alright. We never know what a particular company is looking for, and all we want for this amazing crafting community is to give our support and do our best. Regardless of this outcome, it really is a sweet store with amazing products, and I know you will all enjoy this fun challenge. 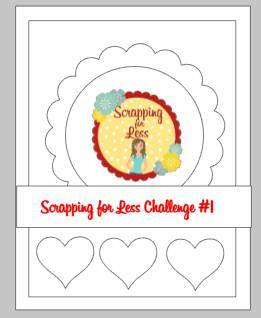 I hope you will stop by to check out Scrapping For Less and check out this fun challenge. Thanks SO much for stopping by, and have a wonderful day! Simon Says Stamp Blog - Send A Card To A Friend Day - I'm sending this card to my dearest and most cherished friend.....my Mom. She's such a blessing to me, and I appreciate her more with every passing day. I'd be happy to send YOU a card, too, if you need a pick-me-up. Just let me know. 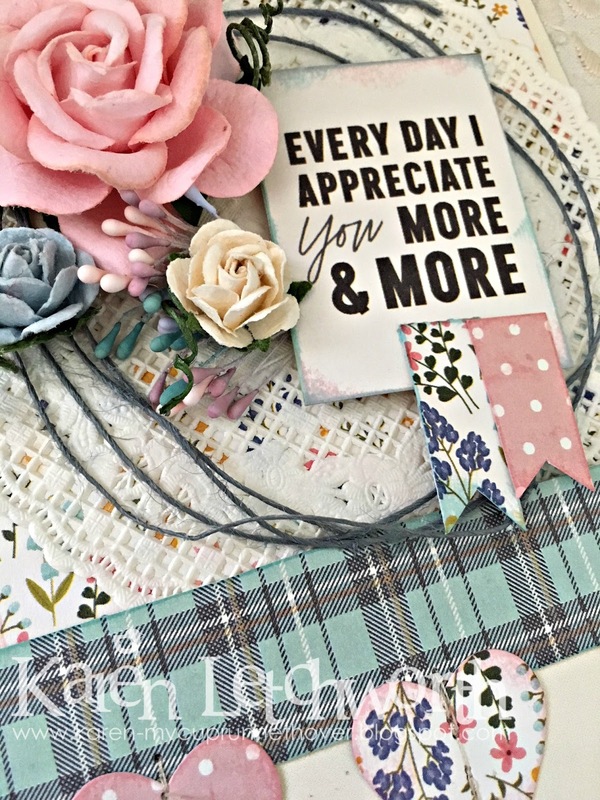 Southern Girls Challenge Blog - Three or More Patterned Papers - I used exactly three patterned papers on this card, and they're all from the same collection (details above). CropStop February Challenge #37 - Anything Goes - I used my Tombow Adhesive, Tim Holtz Distress Inks in Spun Sugar and Broken China, and May Arts Burlap String in Blue. Karen, You always make such beautiful cards!! I can usually spot yours in any link up because of your beautiful style! Thanks so much for linking this up to the Cropstop blog this month! You're a blessing! Love your attentions to details, Karen! 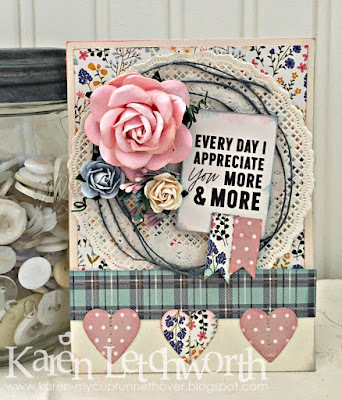 So glad that you join the fun over Simon Says Stamp Wednesday “It Must Be Love” Challenge! Awesome design! Super work! 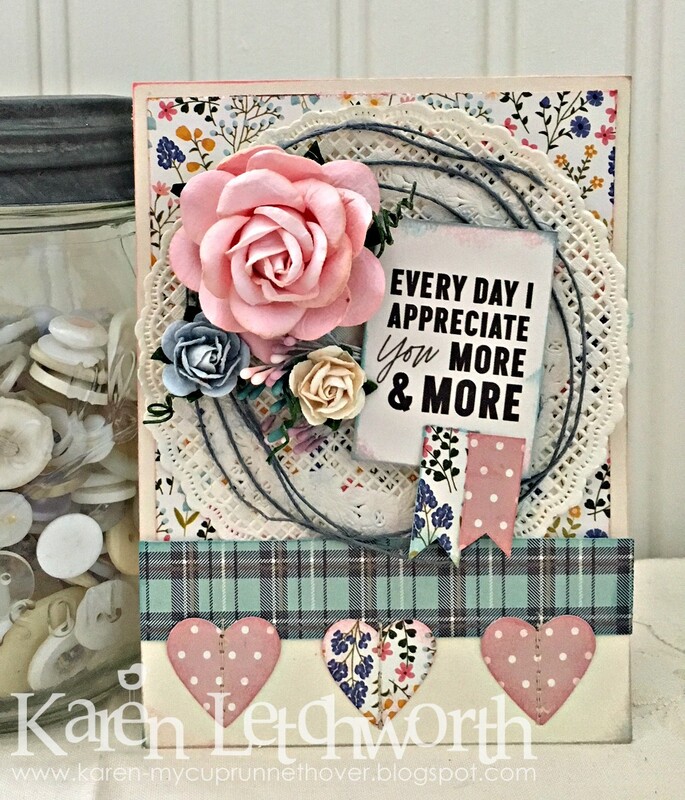 I am liking the flowers added to this lovely layout card - great take on the sketch too - hope all is going well with you Karen - sending prayers your way! Oh Wow que c'est joli Karen! Great Card! Love the colours! Thanks for entering the Southern girls challenge! Beautiful card, I love all your elements. Thanks for playing along with us this week over at The Mod Squad Challenge! what a gorgeous card! I love the mix of patterns! love the whole card!